Government, business and Not for Profits need to do more to address the medium and long-term economic cost and social impact of natural disasters, according to two reports by the Australian Business Roundtable for Disaster Resilience and Safer Communities. The Roundtable reports said the annual cost of natural disasters in Australia is expected to increase from $9 billion to $33 billion by 2050. The reports, The Economic Cost of the Social Impact of Natural Disasters, and Building Resilient Infrastructure, analyse the social impact of natural disasters, and the benefits of resilient infrastructure assets in extreme weather events. 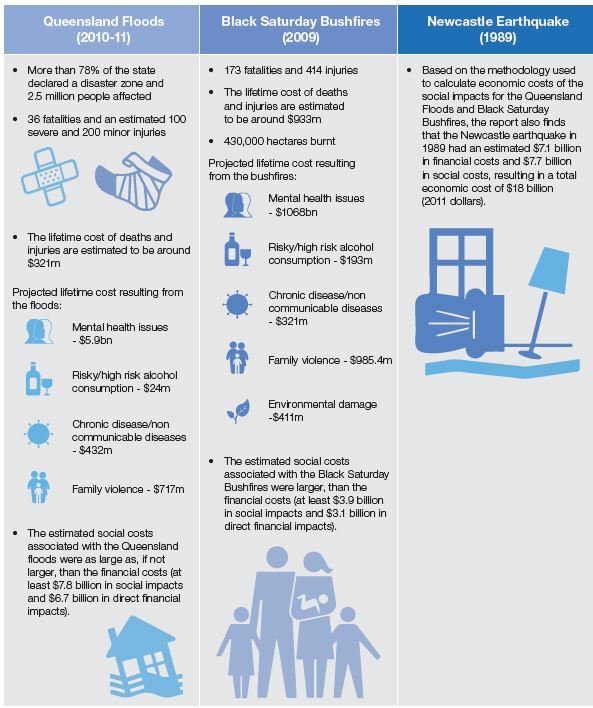 The Economic Cost report found that when social impacts such as mental health issues, family violence, chronic disease and alcohol misuse, are included, the total cost of natural disasters would average $33 billion per year in real terms by 2050. Roundtable spokesperson and IAG CEO Peter Harmer said the two new reports, prepared by Deloitte Access Economics, revealed that social devastation and the impacts to infrastructure can be the longest lasting and most significant consequences of natural disasters. Australian Red Cross Director of Australian Services, Noel Clement, said the framework developed in The Economic Cost of the Social Impact of Natural Disasters revealed the true cost of natural disasters was at least 50 per cent greater than previously estimated. “Deloitte’s modelling showed that last year’s spate of natural disasters left a damage bill of more than $9 billion, which was about 0.6 per cent of our Gross Domestic Product (GDP), and this is expected to double by 2030. Highlighting three specific case studies from differing regions and periods – the 2010-2011 Queensland floods, the 2009 Victoria Black Saturday bushfires and the 1989 Newcastle earthquake – the report estimated that social costs are at least as much as, if not higher than, tangible costs such as the destruction of property. The Building Resilient Infrastructure report found that $17 billion will need to be spent on the direct replacement of critical infrastructure such as roads, railways and hospitals up to 2050, as a result of natural disaster events. The true cost of natural disasters is at least 50 per cent greater than previously estimated when social costs are incorporated. When both financial and social costs are included, it is estimated the total cost of natural disasters in Australia in 2015 exceeded $9 billion, or 0.6 per cent of GDP. This is expected to double by 2030 and to reach an average of $33 billion per year by 2050. Pre and post-disaster funding should better reflect the long-term nature of social impacts. A collaborative approach involving government, business, Not for Profits and community is needed to address the medium and long-term economic cost of the social impact of natural disasters. Governments, businesses and communities need to further invest in community resilience programs that drive learning and sustained behaviour change. Further research must be done into ways of quantifying the medium and long-term costs of the social impacts of natural disasters. More than $450 million was spent by Australian governments each financial year on restoring essential public infrastructure assets following extreme weather events between 2002-03 and 2010-11. This equates to about 1.6 per cent of total public infrastructure spending. $17 billion (in net present value terms) will need to be spent on the direct replacement costs of essential infrastructure impacted by natural disasters between 2015 and 2050. Total spending on infrastructure between now and 2050 in Australia is projected to reach approximately $1.1 trillion. Infrastructure planning processes to be improved to integrate resilience in government and industry decision making by adopting the principles for resilience. Improve incentives through policy change and funding arrangements that ensure disaster resilience has been considered and incorporated, where appropriate, into infrastructure planning. Invest to strengthen the technical capacity of practitioners to identify, analyse and evaluate the costs and benefits of resilience options. The Roundtable members are the Chief Executive Officers of the Australian Red Cross, IAG, Investa Office, Munich Re, Optus and Westpac.